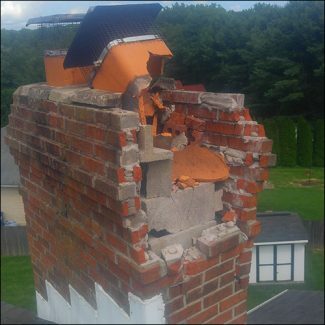 From the bottom to the top, our masons and craftsmen can rebuild and restore your chimney so that it is better than new. • Crown Rebuilding – The crown is the masonry layer that covers the top of your chimney that prevents water from seeping into the masonry below. Water damage not only causes more expensive repairs, but is a fire hazard as well. Advanced Chimney Solutions uses Chimney Saver products that offer a technologically advanced crown that is guaranteed not to crack. We back that up with a 15 year warranty on all crown work; that is 5 years longer than the standard manufacturer warranty offered by our competitors! • Waterproofing – There are many reasons water gets into a chimney and we can fix them all. We provide replacement of leaky flashing, tuck pointing, masonry repair, whatever it takes to keep your chimney safe and dry. •Chimney Cap – The cap sits above the crown and is an essential part of protecting your chimney – without one it is like having a hole in your roof! Rain, debris, even animals can enter and cause expensive repairs. Embers and sparks can also escape causing a fire hazard. We offer a lifetime warranty on all stainless steel or copper chimney caps. •Chase Top – how is it different than cap? Leaky or damaged tops made of masonry are potential hazards on pre-fabricated metal fireplaces. We eliminate the problem by replacing masonry and rusted metal tops, with new, custom, chase tops to fit your chimney. • Chimney Relining- Maintaining an intact lining is essential to prevent dangerous carbon monoxide from seeping through your unlined or deteriorating chimney. Usually consisting of an inner layer of clay tiles, the lining is designed to keep heat and gases inside the chimney. This prevents overheating of the combustible materials of your house and keeps them from igniting. The liner also keeps carbon monoxide, smoke, creosote, and other by-products from seeping into your home. When a clay liner was never installed, or when it is damaged in any way, the National Fire Prevention Assoc. Code 211 requires it be replaced.